If you have ever found a science textbook boring, I assure you this is the furthest thing from it. Read from September 1, 2017 to September 4, 2017. Many of us don’t explore physics past high school. I know I sure didn’t. It was not out of lack of interest but my math skills were always poor and so I just avoided the class altogether to save myself and my grades. Yet before school smashed my learning desires on the subject I loved science and space. I grew up adoring Bill Nye the Science Guy and appreciated the fun approach that the show took. Neil deGrasse Tyson is like Bill Nye but for adults. He makes the idea of learning about space fascinating again. This book is exactly how it is described. A short read that is a little over 200 pages long that entails the basics of astrophysics and some of the major people and discoveries that have been made. If you have ever found a science textbook boring, I assure you this is the furthest thing from it. This book covers all the basic theories, like gravity and Einstein’s theory of relativity and how they are both still playing a major factor in the progress of science today. The book is able to get technical without getting overly complicated as it perfectly caters to beginners in astrophysics. While I did not know much about Neil prior to this book, his personality is hard to miss. I often read the interviews that he does in National Geographic as well as watching the few educational shows that he has cameoed in. Neil is funny, smart and engaging and his writing style is very much the same. At one point in the book when he is going over a few of the essential laws, he describes a funny situation in which he orders a hot chocolate with whipped cream at a coffee shop and when it arrives there is no whipped cream. The barista states that it has sunk to the bottom but as Neil knows that “whipped cream has low density and floats on all liquids that humans consume” so he offered the barista two possible explanations, “Either the laws of physics that apply everywhere in the universe are suspended in your coffee shop or you didn’t put whipped cream on my hot cocoa.” Neil’s lighthearted humour is what makes this book truly exceptional and enjoyable. Even if you are only moderately interested in science and astrophysics I would recommend reading this book. Its content is important and awe-inspiring. It is truly remarkable how much we have been able to learn about space and our world and just how much further we have to go. It is a lovely reminder that we are all apart of the bigger picture. Read from May 31 to June 08, 2015. For the last 60 years science has been using reproductions of the same cells for massive amounts of scientific research. They’re called the HeLa cells as they are named after the woman they were taken from, Ms. Henrietta Lacks. The cells were taken without Henrietta’s knowledge so for years, no one knew anything about the woman whose cells changed the face of scientific research and has helped save and heal millions of people as a result of this research. Almost on a sort of calling, author Rebecca Skloot felt strongly that she should find a way to tell Henrietta’s story and know more about the extraordinary person that made history by having her cells become the first ever to be replicated. Henrietta Lacks came from very humble roots. She was born in Virginia in the summer of 1920, where her actual given name was Loretta Pleasant. To this day no one knows why or when she started going by Henrietta. The US was still segregated at this point so many black families were still not respected and were doing difficult work for very little pay. Henrietta and her family were tobacco farmers. Henrietta had her first child at 14 and married her first cousin. In 1951, Henrietta was diagnosed, at the only hospital that would treat black people, with cervical cancer while likely being pregnant with her fifth child. After the birth, doctor’s removed a lump in her cervix in which her cells were then also taken. In this day and age, doctors were not required to be accountable for removing cells or anything of the sort. They were even allowed withhold information if they didn’t believe it was on the patient’s best interest. It sounds outrageous but it was a common practice in this time period and people didn’t question their doctors. Black people were often treated as guinea pigs as well for any sort of research or experimentation. After the lump removal, Henrietta then went through a few sets of tube radiation treatments. Sadly, her cancer was misdiagnosed, as the specifics and differences between the types of cervical cancer were just starting to emerge at this point. The treatment itself is horrifying to read. Science just didn’t have the capacities to deal with cancer all that well during this time period and her radiation treatments were so strong that it charred and burned her skin. Henrietta tragically did not improve and was in a significant amount of pain. She died on October 4, 1951, at the age of 31. Autopsies revealed that the cancer had spread through her entire body. What makes this story enthralling, and equally horrifying, is question of the ethics and the morals of medicine when it comes to our cells and our bodies. 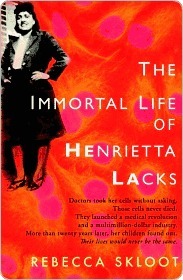 Henrietta’s cells, or rather her cancer cells, were unique, because they were the first cells to stay alive and reproduce in a laboratory. However, they were taken without her permission and since then her cells were sold, and are still sold by the billions to companies in the pursuit of scientific research, yet Henrietta’s remaining family members can barely afford their health insurance. They have not seen a penny of the billions of dollars of revenue that the HeLa cells have created. So the question that is still an issue today is, do we own our own cells and tissue? What sort of consent is required in order for scientists to use our cells? Are we entitled to earn a portion of the revenue if our cells or tissue are used and sold for scientific research? Scientists, or rather companies, have fought and won that if people could choose what their cells were used for and received part of the profit for it that it would inhibit scientific research. The counter argument being that research companies are already monopolizing their research for monetary gain and are inhibiting research anyway. Skloot also detailed the difficult process that she went through in trying to obtain all of this information from the living members of Henrietta’s family. The media had used and abused Henrietta’s family over the years and many of them were angry with what happened to Henrietta and the HeLa cells. They wanted some sort of retribution, and you can’t really blame, so they were hesitant to talk to anyone. Skloot was able to work her way in with Henrietta’s daughter, Debbie, who truly just wanted to know more about her mother and how the whole situation unfolded. While this portion was an interesting and necessary add to the story, I felt that it overtook a little bit near the end. I loved the history and science in this book the most. In 2013, the National Institutes of Health gave Henrietta’s family some control over access to the cells’ DNA code and now 2 members of her family sit on a committee that regulate that code. Overall the book posed some serious ethical questions that are still in debate today. The book is an amazing and passionate tribute to Henrietta and it has helped to ensure that her short life and sacrifice are not to be forgotten. A portion of the proceeds from purchasing this book are donated The Henrietta Lacks Foundation , which help to provide financial assistance to individuals who have made important contributions to science without their consent.